Avertis has a systematic knowledge transfer processes to collect data and ramp up teams quickly. This helps our customers with quick resolution of the problems, decreases dependence and increases expected productivity of new team members. We help to set up a systematic management of process by which knowledge is identified, created, gathered, shared and applied across the Organization. We shall ensure that you have the right knowledge at the right place, at the right time in the right format. Education is the milestone of any civilization. Realizing this, we at ELITE SOFTWARES PVT. LTD. have branched out towards providing our services to this sector.. Knowledge share is an emerging concept that integrates knowledge management and knowledge organisations. Our services would provide you with content-based (data, information, knowledge) organisational outputs (advice, answers, facilitation), to meet the needs of students and researchers. The plan is to create a momentum among institutes and organisations in understanding Photonics. Series of Short informational Seminars to update and upgrade the Entrepreneurs with varied business related information affecting the business growth and profitability. 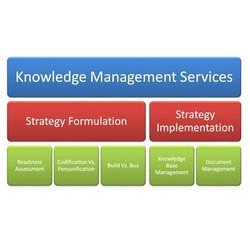 ACS Knowledge Management features SharePoint expert design and implementation support. It also entails portal design, development, deployment, and sustainment. Capturing and utilizing the collective knowledge of the organization and diverse systems is a challenging problem for enterprises. Advances in Information technology have made storing, retrieving and reporting on structured data easier and faster. However; the storage capability of unstructured data was limited. A proven replicable practice or project which has been implemented within the company and is generating measurable savings, cycle time improvement, or increased value to customers without compromising product quality, safety, health, or the environment of the process. researchpro is developed by harrier to automate production and distribution of equity research reports end-to-end including document management, workflow, team collaboration and publishing. Please refer to the attached success story. Savoir, c'est pouvoir. Aujourd'hui, pour rester compétitives, les entreprises doivent gérer efficacement leur patrimoine de connaissances. [ CALYS ] vous aide à faire fructifier le capital "Savoir" de votre entreprise.